Let’s face it, John and I don’t always think the same activities sound fun. 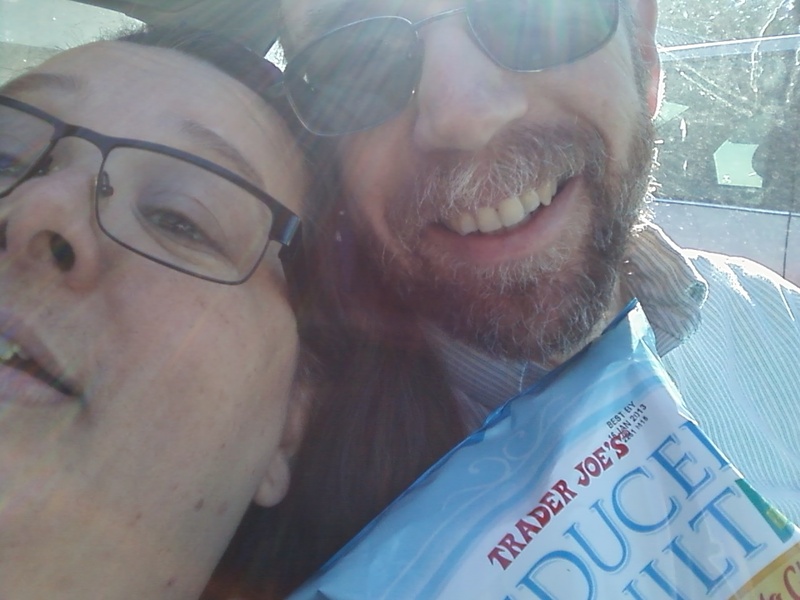 We got some “everything” free lunch at Trader Joe’s. Let me tell you. It is hard to find food on the go that is GF, sugar free, dairy free and soy free. We did see the best product title ever! We had to buy it. 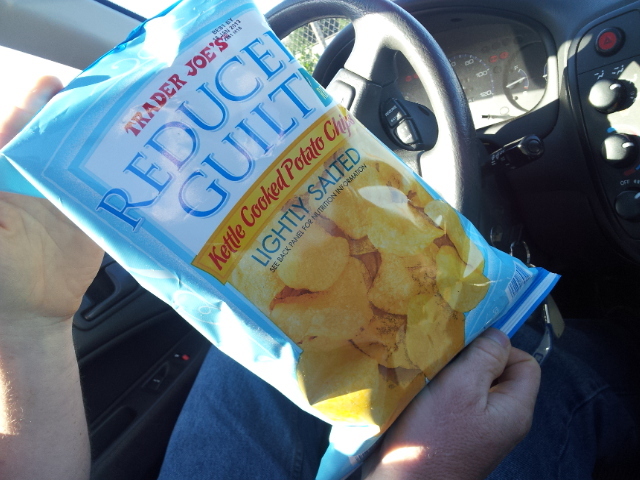 Reduced Guilty potato chips. LOL. As if! They were pretty tasty… but we still felt a little guilt. We also stopped at Deseret Book and cased the place for Christmas ideas. 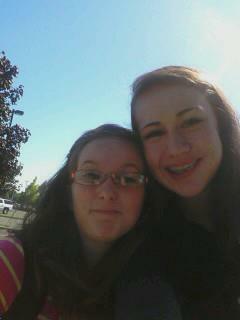 Then we headed to downtown Portland. I still had no idea where I was spending the day. As we turned a corner I saw the huge posters…. 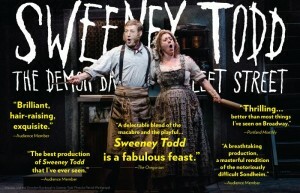 I WAS GOING TO SWEENEY TODD!!! I love that show! Sure. It’s a little gross. It’s a bit goth. But the music is superb! The lyrics are witty. I’ve always wanted to see the show live. I’ve see the Angela Lansbury Broadway production on PBS, but I had never seen it live. I had memorized the songs many years ago and it was so exciting to know that I was now going to see the pictures to go with the music. I’m writing a different blog about Sweeney, so be sure to check back later. 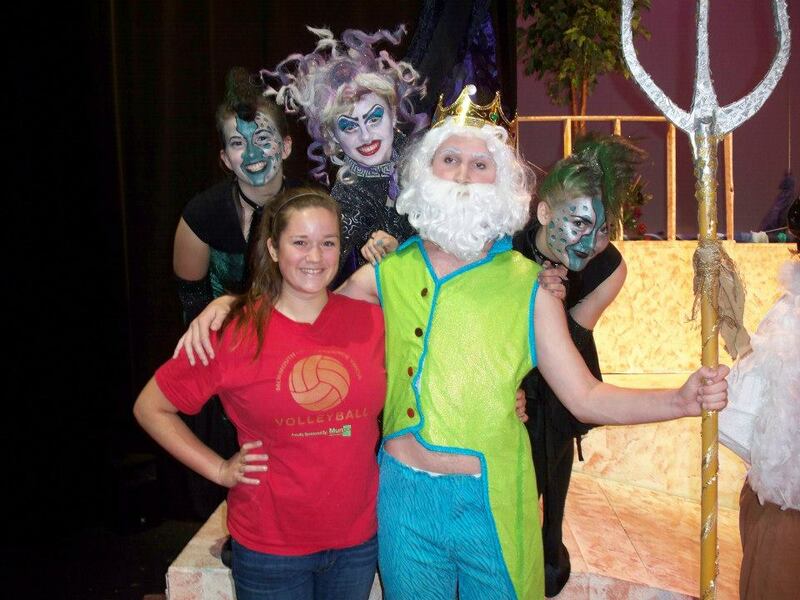 After every show we would open the curtain and leave on stage lights so people could take pictures with the cast. The “Evils”, as I like to call them were busy, but not as busy as Ariel. Originally, Hannah was cast as one of these guys… the Mer-sisters. 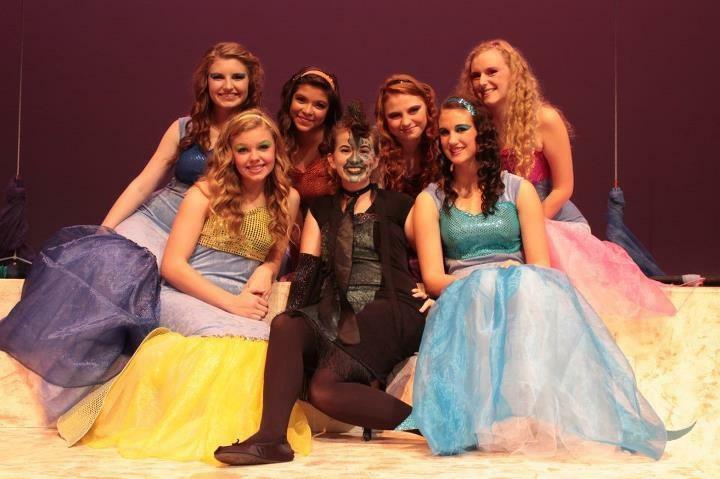 Although, most of these girls are Hannah’s age and her friends, and I know she would have had fun as a Mer-sister, I know she had a great time being a sneaky eel. 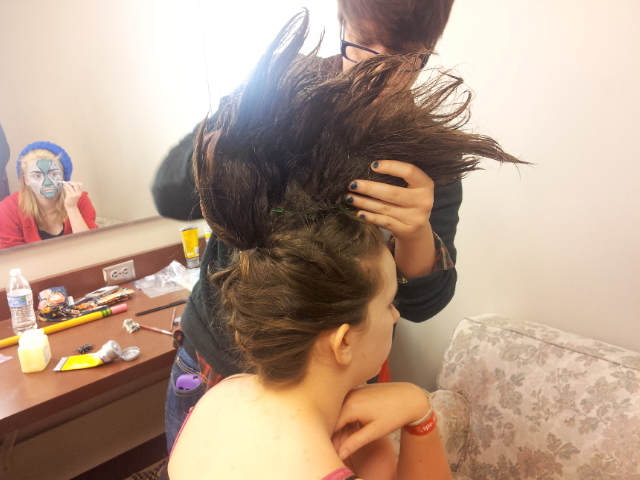 Getting Hannah’s hair into that Mohawk was long and tedious process. First, she got better results after she got her hair trimmed. 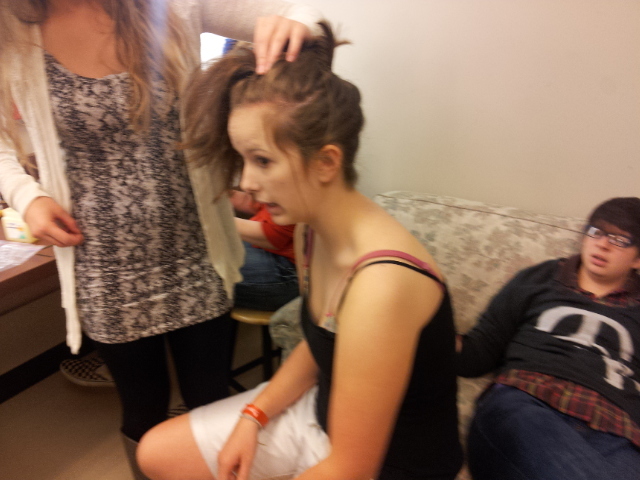 first, Kimber and Katie french braided Hannah’s hair upside down. Hannah would sqweell and complain the whole time. I guess she has a VERY sensitive head. Then Katie would do this twist pinning thing and start the process of making the “tail” into a thin spin along Hannah’s head. Meanwhile, Hannah continued to complain. 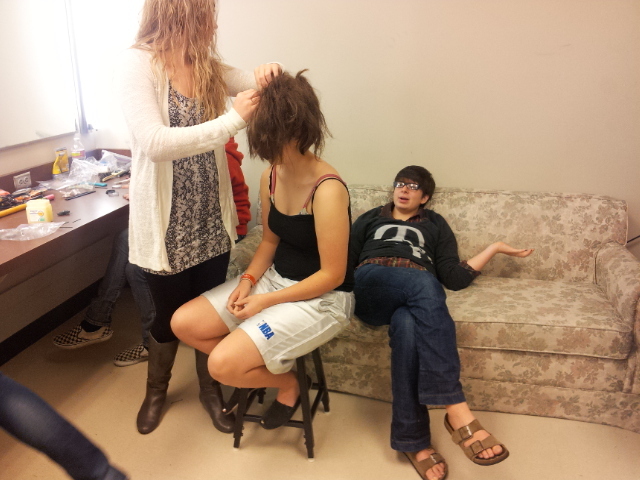 Then Kimber would slather Hannah’s hair with hair glue and hairspray and they would blow dry the mess until it stood up and was stiff. Then Hannah headed to the scene shop so that she could be spray painted with black, orange and silver strips. Then she would come back to the make-up room and start painting her face. 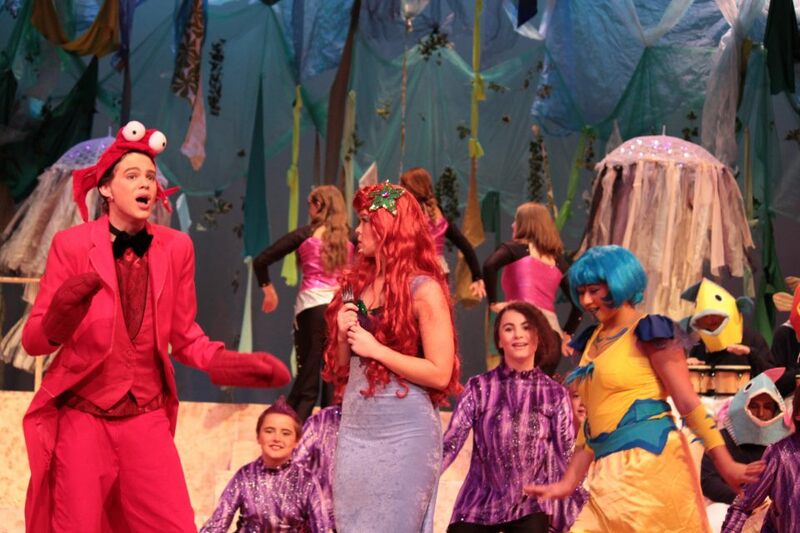 Kimber help design the whole look and was nice enough to come to every performance to help Hannah and Chloe (the other evil eel) pull off this great look. Saturday afternoon was a matinee. 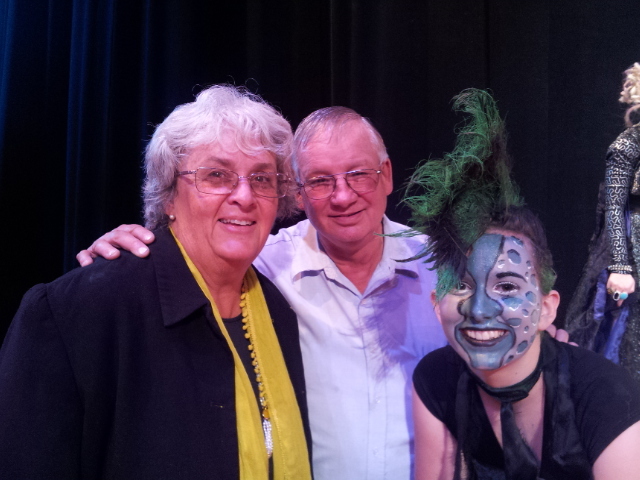 My parents surprised us and came to see the show. They work at the Portland temple once a month on a Friday/Saturday morning shift. They stopped by on the way home to drop off more dresses for McKay’s wedding. Kimber’s dress is so cute! It fits very nicely. Grandma also finished McKay’s friend, and her new sister-in-law dresses. I sure hope they fit everyone. There will be little time to fix it if they don’t. 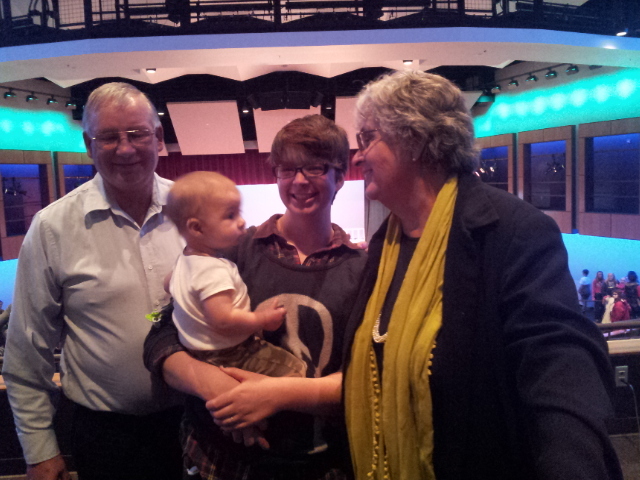 Now Hannah has time to spend with friends…. at least for the next couple of weeks. The next show auditions in two weeks. Hannah studying up on Once Upon a Mattress in the hope that she can have a decent part. She sure likes to perform. She is talented (I know, I am biased), but she is also humble and has a great attitude when she doesn’t get the part she wants. Her biggest hurdles are her mom (we don’t to look like we are playing favoritism) and that she is a freshman. Hopefully, there will be many roles in her future. The other big news is that Chad’s coach gave him an award for being inspirational. 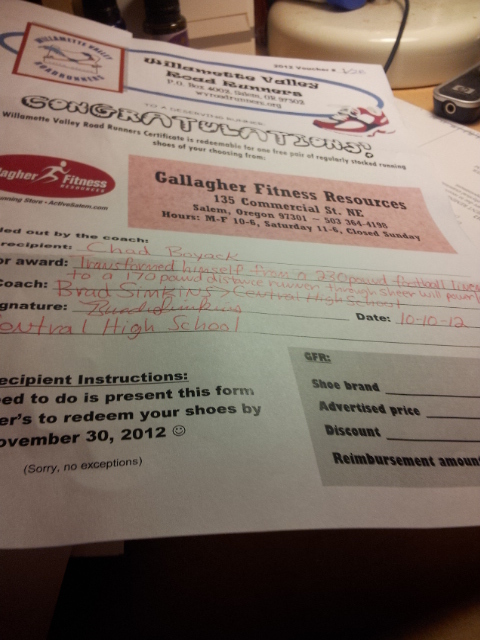 He got a certificate for any pair of running shoes at a local running store. He could spend up to $200! He is pretty inspirational. A few days later he ran his last regular race. He did great! He cut a whole minute off his 5k time. This qualified him to run Districts this weekend. None of us were able to go to the last race because it was so far away, but we won’t be missing the next race! Sunday was nice and relaxing. After a crazy, busy week, it was nice to just have a relaxing day and family dinner. 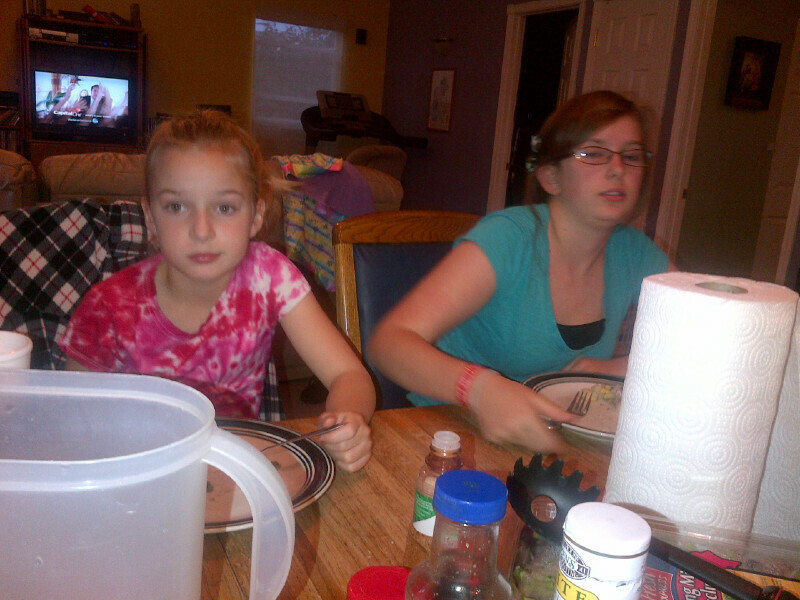 Ray and Kimber came for dinner. Hannah made comfort food. John, Lillian and I even got in a short little stroll in the fall mist/rain. The final big news of the week is that Ben may be finally getting his first tooth. 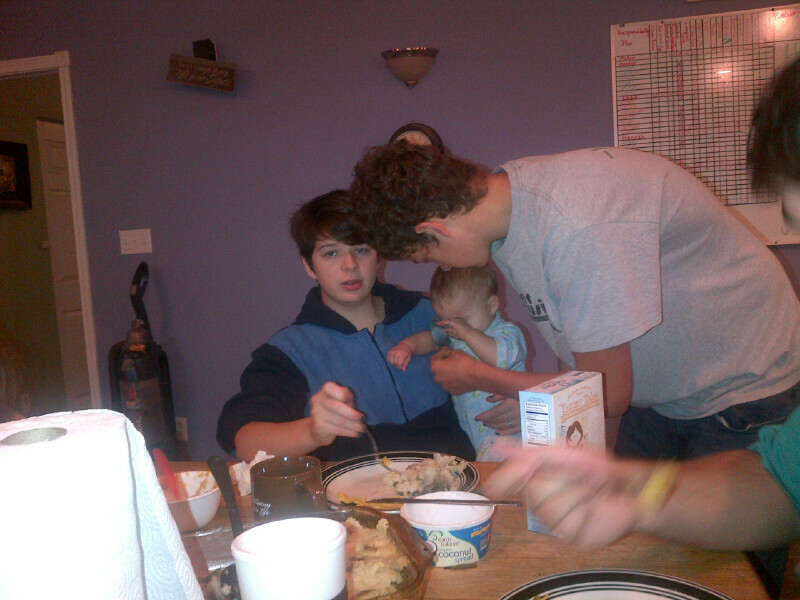 All of Sunday dinner Chad tried to get Ben to show him the tooth. Ben would just stick his tongue out. I don’t think it’s pushed all the way through, but that little tooth is making an appearance! This week is a little calmer, but we do have concerts, and braces, and pumpkin carving, and Chad’s big race to look forward to. Originally posted 22nd October 2012 by Wendy on Resigning as the General Manger of the Universe powered by Blogger.